UDM Downloads > LeaderTask Company Management! 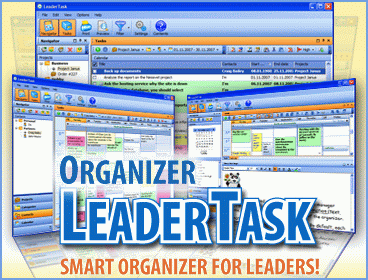 LeaderTask is a system for employee management, assignment control, project management. Contains all the necessary features for comfortable employee management: giving and controlling assignments, working over the Internet, working in the autonomous mode, shared access to projects and contacts for employees, instant messaging, viewing employees' calendars, centralized file storage, mobile version for Android, iPad, iPhone. LeaderTask is used to effectively control the employees over the network, distribute tasks among employees, set deadlines, monitor the progress, control the results, maintain your customer database (a CRM system), keep the history of relations with partners, store corporate information. You can install LeaderTask application on Android device and iPad/iPhone and delegate tasks straight from your mobile device: smartphone, tablet, notebook or netbook. With LeaderTask Company Management, it is possible to organize a virtual office, which means that the employees will be able to exchange tasks and text messages (chat), have shared access to projects, see other employees online statuses, assign tasks to each other, see the progress in projects. And all that taking into account that all team members can geographically be anywhere. The most important things is access to the Internet. What you will get if you use LeaderTask Company Management: 1. Increased efficiency of the manager: no hectic activity, predictability, lowered risks, the manager can see the exact picture of what is going on at any moment, more spare time, controlling employees from outside of the office via the Internet. 2. Increased employees' efficiency: no I forgot, I didn't know, I didn't have time, less delays, missed deadlines, no more hectic activity. 3. Increased work discipline: everyone knows what to do, what they are responsible for and there is always to hold responsible. LeaderTask Company Management - Your Business Under Control!